Features, advertising, letters are welcome. tony.jasper@btinternet.com. Do you realise that as a Christian of whatever ilk or kind, you are a “warm” and “loving person” “, generous in giving”, and “yes, good-humoured”, “hopeful,” and “caring,? “ Take a brief moment to feel good! These worthy and pleasing attributes were named by countless thousands who were asked to say what they thought of a particular Christian they encounter in their lives. The Barna Group, on behalf of the Church of England, Hope and the Evangelical Alliance has been exploring how the great mass of non-churchgoers view Christians, And the result came in the set of words listed in the first few sentences of this feature. No one was more surprised than Steve Clifford, the general secretary of the Evangelical Alliance. It comes as a pleasant relief after a so-called survey found 53% of the British population said they were not Christian. Of course it was a selective bunch that were asked, unless someone failed to send me a voting form. 47% said the opposite. The press almost lost control of its desire to paint negative headlines and summaries as many articles more-or-less suggested it was all over for the Christian camp, as they saw for the first time Christians were in the minority, although if accepted it still represents something over 25 million saying ‘yes’. In view of the latter figure they could have motored on a whole range of positive notes in saying there are far more Christians than Saturday football followers, than movie goers, than teenagers, than school children, than those on a Saturday night drinking away in public houses, than those daily eating cornflakes or even a Mac. Naturally, they did not – no story. Of course some people are happy, whatever, or seemingly so to observers. In a Times article, October 22, 2016, the Arsenal football manager Arsene Wenger hit the God track. He is reported saying “I said if God exists, one day I go up there and he will ask ‘Do you want to come in? What have you done with your life?’ And the only answer I have is “I tried to win football games.’ He will say , “Is that all you have done?” Even the Financial Times gives space and points the way to Christian understanding, shall we say “helping out the rich” to find greater happiness. Its writer Julian Baggini is concerned that many people find themselves torn between enjoying capitalisms riches and yet they find its excesses embarrassing. To this, and unexpectedly, he asks :”Can religious voices help to resolve these conflicts and help us find a better way of life?” He doesn’t suggest giving the money away, so there is no point enquiring. Brits are far from the only people where there is suggestion Christians make for the happiest people. In the US, Trump or no Trump, three out of ten people claim they are pretty satisfied with life, happy, healthy and moral, too. 30 per-cent of US adults say they pray daily, attend church at least once a week. 62% of these are women, just over half are non-white. In one detailed survey it was found that the group with greatest sense of happiness is found in the 65-79 age bracket, whereas the lowest 45 to 59. According to UK Essays, said to be trusted by students since 2003, religion encourages the best nature, “which could lead us to act happily, willingly and voluntarily.” The questions asked by various survey bodies come wrapped in a rather different religious framework from a few decades ago. Yet, am I wrong to suggest that few preachers direct their sermons to the idea that if you believe, you will find an inner “peace’. THIS FEATURE FIRST APPEARED IN THE BRITISH ‘METHODIST RECORDER’. Methodist Central Hall Westminster 0ctober 29. 2017. It was worship. It was testimony. It was exuberant music. It was an experience. It was a learning and joyful occasion. This was Martin Luther 500 – History Maker – the latest event that went under the tile of “The Gathering’ at London’s, Methodist Central Hall. Furniss, with an accompanying small group of musicians. London West End actors Ruth James and Emma Danby skilfully paced and delivered various dramatic interludes, while Tony Jasper delivered a boisterous loving and angry Luther. Endless articles on Martin Luther have appeared in religious and secular press. In the last eighteen months at least half-a-dozen major weighty books have been published and written by eminent historians and theologians. And here I am with the impossible, how to find and express the salient points in a minor form of drama, within a short space of time. No disrespect is intended but I imagine most of you here this evening have only an inkling of 16th century German religious expression and politics, the nature of Christendom, the power of the one Church that is centred in Rome, into which broad scenario a one-time obscure German monk would trigger events that would divide the Christian church and much of Europe. The English Reformation in its theology and liturgy would be shaped significantly by the generation after Luther. Fortunately I do not have to make sense of the myriad of movements contributing to what has been described as a pan-European Calvinism consensus, rather than a North German/Scandinavian Lutheran bloc. Probably an impossible task, better read, than compressed into some kind of drama presentation. could be so direct and persuasive, a powerful preacher who did not mince his words, who addressed and moved the poor and the mighty. This evening you will hear some of his powerful polemic, travel a little his personal story, take in some of more violent verbal outbursts. Luther, as the Wesleys, as William Booth, and others, found a failing Church, where the Faith was not being proclaimed, even corruption eating its way into its life. Luther would rail against the poor being bled of their limited monies as they were convinced they could buy their way to heaven. He challenged the whole religious system of his time. This text, as others in the past, has built into it the elements of basic ‘worship’. Luther was a great lover of music, both at a personal level, and in terms of church services. Tonight we will sing and hear music from his time that still delights and enthrals. There will be snatches of the German Mass and Order of Service. In the end I am aiming to find from you the sense that it has been good and inspiring to have been here this evening and you can in the end shout a big “HalleluJah!”. Oh, postscript: stay not in 16th century history for Martin Luther was the hero of yes, the father of Martin Luther King. And so he named his son after this renowned German monk. Our famous American in his way, as Martin Luther, talked the language of liberation and freedom for people. And for more, near to the end of the presentation Martyn Atkins will be looking at Martin Luther and the Reformation in terms of today and in this vein we take a beautiful and modern setting of the Te Deum during the presentation. In recent Sixteen- year – old Rai Elle has been battling on X Factor with the gospel song ‘Break Every Chain,’ while rapper Snoop Dogg seems to have thankfully moved away from lyrics of drugs and girls and taken gospel into his system as he joins artist B .Slade for the song ‘Words are few.’ Mid-this month (November) comes the Dylan retrospective gospel set that travels the time when Jesus came into his life in a new way and perspective, and with at the end of the 1970s into the early years of the next decade some of his best music. A taste of this double-CD can be heard on an amazing free 15 track album. True faith comes with the December issue of the long standing music monthly Mojo. It opens with a fascinating rehearsal take of Dylan and his evocative song ‘Slow Train.’ The other fourteen tracks are simply fourteen gems and the whole thing has bee delightfully packaged. Among the artists come such gospel stalwarts and treasures, The Swan Silvertones, Odetta with a fresh sounding version of the much sung ‘Go tell it on the Mountain,’ Johnny Cash and ‘Lead Me Gently Home,” Sister Rosetta Tharpe, B.B.King, The Original Five Blond Boys from Alabama, Mahalia, The Staple Singers, with only Charlie Rich and his ‘Crying in the Chapel” to reduce full marks for this terrific freebie! And while mentioning one freebie, here’s almost another that has 25 tracks and is now in HMV for £6.99 and found in the ‘blues’ section. It’s titled Gospel Blues – Reborn and Remastered (World Music Network). This has a degree of rawness, and if you are unfamiliar with early religious black music expression from the American South, and more into say the immediacy of pop driven worship songs, you might need to discipline yourself to stay with the early tracks. Let yourself be driven by the testimony lyrics, and savour the acoustic guitar workouts. The better known artists include the great blues legend Bessie Smith, Skip James, Blind Lemon Jefferson and as I write, Blind Willie Johnson. Many of tracks are early recordings, hence sometimes the signs of those times on surface noise, but so...There is a version of’ ‘When the Saints Go Marching In’ from Barbecue Bob, with several songs dwelling upon the somewhat mixed signals of some who claim faith and especially told on the charmingly titled ‘Scandalous And A Shame’ from Blind Joe Taggart and the legendary Josh White. SATURDAY NOVEMBER 18: 2-5 p.m.
WITH AMONG OTHERS NATIONAL ACCLAIMED WRITER MICHAEL BILLINGTON OF THE GUARDIAN. An event for everyone interested in theatre and the basic issue for every Christian - how will faith be and has been communicated in a secular environment. Did for instance JCS communicate faith, and if so, what kind? (tube: Westminster. St James Park. Near Westminster Abbey. Parliament). 2-5 p.m.
PLUS 1. TO BRING THIS AND OTHER ISSUES INTO FOCUS MICHAEL BILLINGTON, Britain’s foremost theatre critic joins ACG’s Tony Jasper in conversation at a special ACG event to discuss the relation of faith and theatre. Mlchael writes in the Guardian and on several occasions he has asked why there is so little radical religious writing for the stage. We will discuss this, as well as looking again at JCS (back this summer in London) Godspell, Hair, Jerry Springer, Howard Brenton (Play on Paul at the National) .Sarah Kane. PLUS 2 a playreading by professional actors of the ACG winning play text in its 2017 competition. JESUS IN THE BROOMCUPBOARD by John Coutts who has major Salvation Army connections. Your views and thoughts will be given space. ALL THIS FOR £10 to cover our expenses. Meals at a reasonable price hot and old at the Methodist Central Hall from mid-day. On the 2nd of November I started the day in Bethlehem at the Walled Off Hotel- Banksy’s hotel - right beside the devastating separation wall. 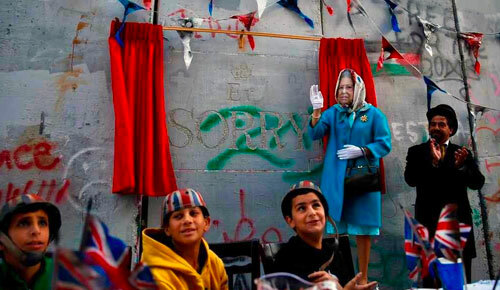 In the morning he put on a remarkable street party with children from Aida Refugee Camp - it was like an old style jubilee party for the Queen, and lo and behold the Queen appeared! A Master of Ceremonies read a message from Banksy about the impact of the Balfour Declaration - because this day was the 100th anniversary of the Balfour Declaration. The Queen then pulled a string and some red curtains opened, and engraved in the wall was the word “Sorry”. The Amos walkers were there, part of the audience watching this. (Click here for information about Amos Trust's Just Walk.) They had walked all those miles to say ‘sorry’, and that afternoon we went into Jerusalem for a service in St George’s Anglican Cathedral where I am an honorary Canon, and we had a liturgy which I had put together along with the Dean, Hosam Naoum. 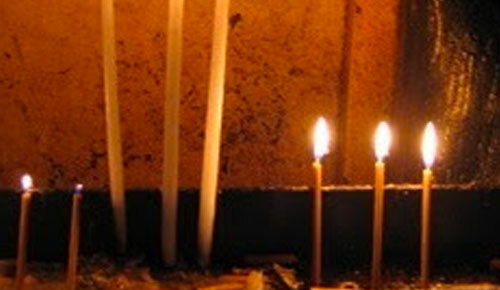 It was a liturgy of lament, repentance and new hope. It was a very special time. “Holy God, we ask that now there may be a generous spirit that supports both Palestinians and Israelis, that brings justice and peace, that treats all as equal human beings." Amos Director Chris Rose came up and spoke, reflecting the motivation that had prompted the walk, and apologising on behalf of Britain for the Balfour Declaration. He was followed by Canon Naim Ateek, who gave a passionate talk about the injustice that had been done to the Palestinians. He also called on all the Amos walkers to stand and asked everyone to applaud them. Naim received a standing ovation himself at the end of his passionate and prophetic speech. A little later on we had a prayer from Zoughbi Zoughbi, the Director of Wi’am Conflict Resolution Centre, a long time partner of Amos. The choir we had booked to sing at the beginning, called the Bethlehem Academy Choir, which included Tarek, one of Zoughbi’s sons, arrived late because they were held up at a checkpoint. Somehow this made the point for the whole event - this is what life is like under occupation. They came and joined me as I was singing Ten Measures of Beauty, with its chorus “Pray for the peace of Jerusalem” and then at the end they joined us as we sang the great protest hymn We Shall Overcome. The audience linked arms and sang with all their might. I saw eyes closed - I saw many eyes with tears. Then we got people to welcome the Bethlehem Academy Choir properly and they did two beautiful songs that finished our service in Arabic. It was a remarkable moment. As our walkers had travelled around Palestine, they were welcomed. Many people had heard Teresa May talk of being ‘proud’ of the Balfour Declaration - the Palestinians were shocked by this because of the suffering it had given them. So British people arriving and apologising meant a lot. 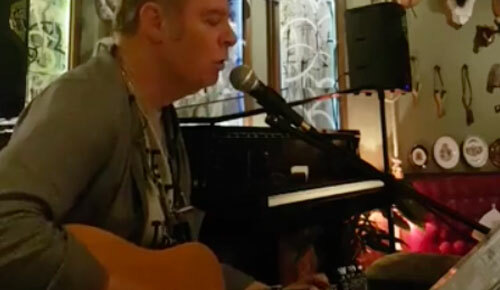 After the service I hurried on back to Bethlehem so that I was in time to do a concert at the Walled Off Hotel. This was a very enjoyable time, informal and relaxed. Long time guide and family friend Wisam Salsaa is the Manager of the hotel, and he made sure the concert was live streamed and you can still see that here. As I sang I was facing the window of the hotel, and there is the huge separation wall just a few yards away, now with the word “Sorry” inscribed on it. What a way to spend this hundred year anniversary of injustice. Lament, repentance and yet new hope were the themes of the day. A week before Gill and I went to Palestine we had been in Nicaragua. I was invited to sing and speak at the 45th anniversary of Amos partner CEPAD. I love Nicaragua. It’s a beautiful country. Yet it’s one of the countries in the world that is most impacted by climate change and visiting it you discover in different ways what that might mean. In the 1980s Oxfam wrote a book called The Threat of a Good Example, and it was about Nicaragua. I still think of that title when I am there. Forty-five years of CEPAD has been a tremendously good example – of caring for the needy, working as peacemakers, supporting people in poor rural communities - and we always get the chance to glimpse a little bit of this. At the anniversary service I sang a new song of mine called Against the Grain, which is about Jesus coming into Jerusalem and taking a stand against the empire and turning tables of oppression, and how we need to be a community that builds an endless bridge to dignity by being a community that follows the example of the “holy rebel Jesus”, as the song puts it. It was a huge joy to be back in Nicaragua and to join CEPAD for their 45th celebration. It was a full house at First Baptist Church, Managua including visitors from the US, Germany and us. What a long way CEPAD has come since those early days after the appalling earthquake in 1972 when Gustavo Parajon brought church leaders together to serve the people. 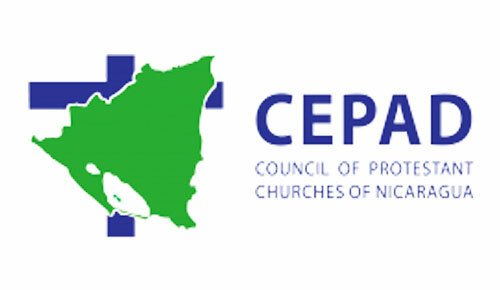 Ten years later CEPAD worked through the Civil War earning respect and becoming involved in peace and reconciliation. Today, 2017, the main focus is on the development of rural areas in Nicaragua. The model CEPAD has evolved is not one of top down, handing out help and advice, but one of accompaniment and empowerment thus enabling communities themselves to identify and train up their own chosen representatives. It is a model created by Gustavo which has been instrumental in the mentoring and inspiring of Amos Trust over the years. It is a model of friendship, cooperation and listening. Another day we went out to Teustepe, to the Amos project, and saw how a community had walked forward since we had previously been there, despite being devastated by recent hurricane Nate. 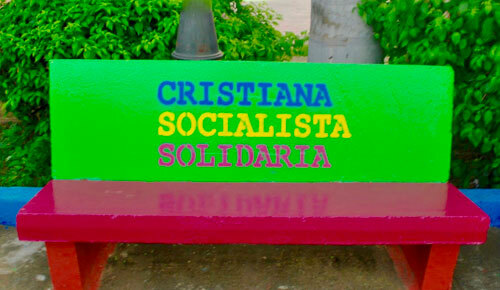 I have probably mentioned before, the amazing slogan of Daniel Ortega’s government - and they’re about to have an election there – the slogan is “Cristiana, Socialista, Solidaria”, Christianity, Socialism and Solidarity. I have often thought, what other country would have a slogan like this? Their latest slogan talks of the Sandinista government winning but then says, “By the grace of God”. No government is perfect, there are struggles in every community, but this is a government with a preference for the poor, one that seems to be trying to live out the values of justice and Jesus.